Enterprise IT leaders spend a lot of time and energy on their cloud strategies, determining which deployment models to implement, which workloads to migrate, and to which vendor’s cloud services to subscribe. They have high expectations for their cloud solutions as they are looking to reduce costs, introduce business agility and speed to market, and create process efficiencies. 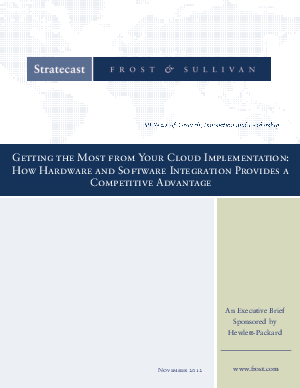 In this white paper, Stratecast explores the relationship between hardware and software components in delivering a high-performing cloud environment. We present a list of questions to guide the reader in evaluating the offers of different cloud providers. Finally, we consider HP integrated solutions (hardware tuned to service automation platforms) as an effective choice for building a high-performance cloud environment.